In July 2009 was fortunate to accompany a realized mystic on a yatra to Trimbakeshwar and Shirdi. The revered Swami was also going to Vrindavan later. I was very tempted to ask whether I could accompany but something held me back. Then in the midst of a telecon, I decided to make the trip during the long Janmashtami/Independence Day weekend. It all happened in the matter of minutes. My friend in Vrindavan sent sms saying I was welcome. I was lucky to get a cheap air ticket to Delhi and the travel agent assured me of a tatkal train ticket from Mathura to Mumbai. I have always believed you go for a yatra only when bulava aata hai (time is right). Then things just fall into place. Left Mumbai by the 6.30am flight on Thursday morning. From Delhi Airport took a pre-paid taxi to reach Ashram road crossing by 10.30. Got into a Haryana Roadways bus that took about three hours to reach Vrindavan. As I entered Vrindavan nagari felt very nice, some sort of serenity overtook me. After having lunch was ready to with the Vrindavan Parikrama. Start the Parikrama from the ISKCON temple, then take a right and walk on. It takes 3-4 hours depending on your speed. 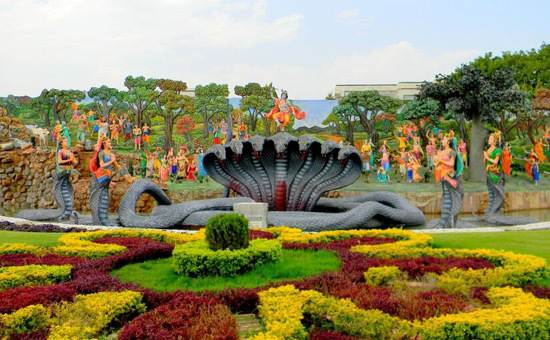 The route is Krishna Balaram tree, Gautama Rishi Ashram, Varaha ghat, Ishaan goshala, Madana Mohana temple, Kaliya Ghat, Imli Tala, Sringara Vata, Keshi Ghat, Tekani Rani temple, Jaganatha temple and Lord Chaitanya temple. Started the parikrama at 3.30pm. The Krishna Balaram Tree is a small tree. You have to ask for its location? You are supposed to do the parikrama barefoot but I chose to wear mojris. My first stop was the Gautama Rishi Ashram. It is a very ordinary structure. I walked in and met a few Sadhus. Kept on walking till I reached the Madana Mohana temple. Sanatana Goswami discovered the deity of Madan Mohan. 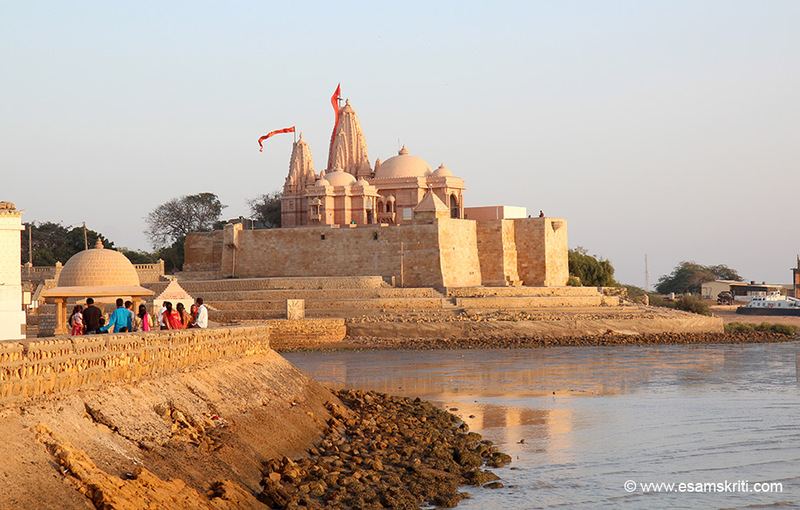 Ram Das Kapoor, a merchant, donated funds for this mandir in 1580. When Muslims attacked in 1670, the original deity was moved to Jaipur and later to Karoli. After doing darshan came to the main ghats where flows the holy river Yamuna. Hired a boat that took me for a half an hour ride on the river Yamuna. A good way to see and enjoy the Ghats is from the river i.e. what I learnt from my Varanasi trip. 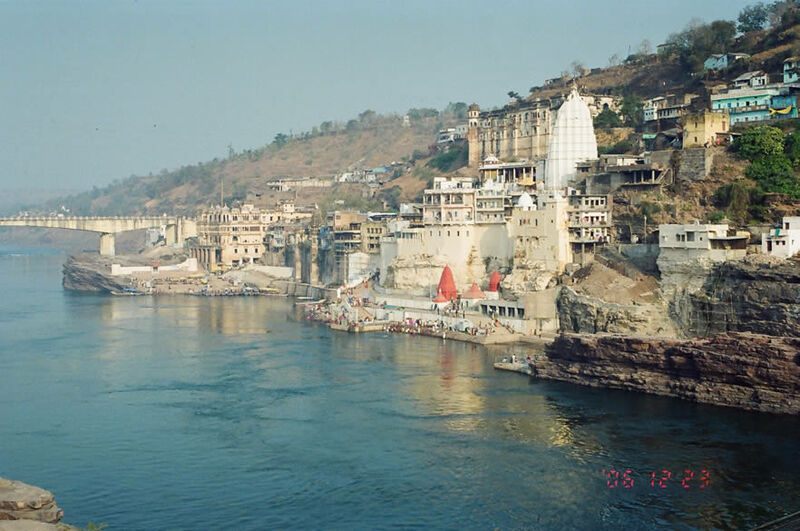 The main ghats are Yashoda Ghat, Aarti ghat, Gopi ghat and Kesi ghat (where Lord Krishna killed the Kesi demon). There is a tree at the famous Chir Ghat where gopis hung their clothes while bathing in the Yamuna. According to tradition Lord Krishna took away their clothes. Today devotees tie a piece of cloth to the tree. My next halt was Jagannatha temple. It has beautiful Jagannatha, Balarama and Subhadra moorthis. This temple is said to mark the place where Lord Caitanya sat when He came to Vrindavana. By about 6.30 was close to the ending point. I was very tired so decided to take a cycle rickshaw back home. I dozed off to sleep, unknowingly one of my mojris fell off. 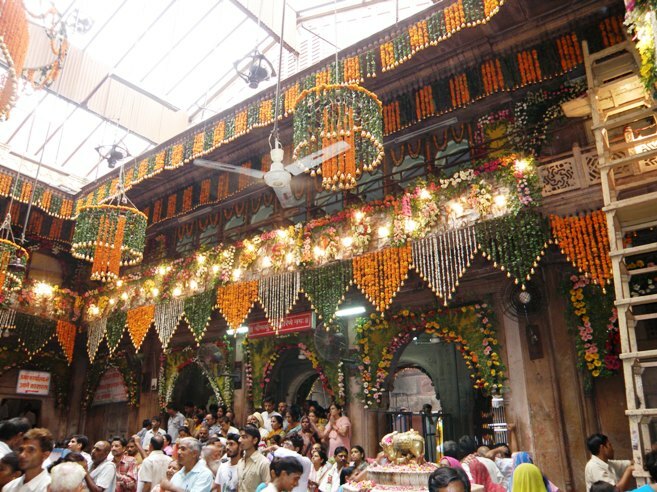 The next day being Janmashtami my hosts advised me to visit the main temples of Vrindavan. I did this barefoot and felt as if the spiritual energy of Vrindavan entered body through my feet. Joy of walking barefoot can be realized when experienced. The temples visited and sequence of visit are Banke Bihari temple, Radha Ballabh temple, Sewa Kunj, Sri Radha Damodar Mandir, Radha Ramani Mandir, Nidhivan, Raghunathji Mandir, Brahmakund, Govindji Mandir, Jaipur Mandir and Katyani Devi Mandir. I started the day by attending the 7am aarti at ISKCON temple and left for these temples by 9.30am. Most temples close between 12pm and 4pm. So could visit only a few temples before 12, the rest had to visit after 4. 1st visit was to Bankey Bihari Temple. It was beautifully decorated on the occasion of Janmashtami. 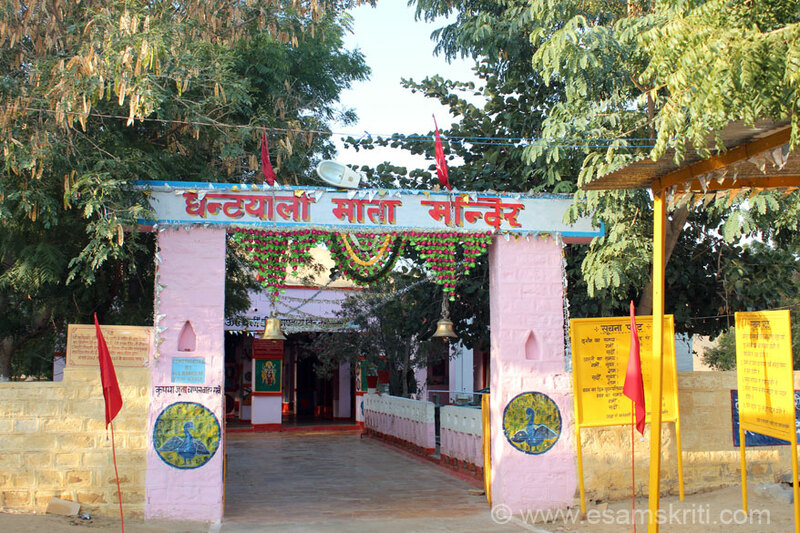 Established in 1864 by Swami Haridas, this temple is one of the most popular ones in Vrindavan, especially during Jhulan Yatra, the swing festival in the month of Shravan (July/August). Next was the Radha Ballabh temple. According to tradition a visit to the Bankey Bihari mandir must be followed by a visit to this temple. Then was Sewa Kunj. Earlier Vrindavan was full of wild tulsi as is present here. This is the sacred place of the Rasa dance, where Lord Krishna would offer service to Radharani by decorating Her hair with flowers and by massaging and painting Her lotus feet. According to people who stay close to the Kunj every night Raas or dance takes place here by gopis. Monkeys throng the place all day. If you visit at night it is said that you die or become mad. Went to see Radha Ramani Mandir. Very powerful temple. Felt really nice after visiting this temple. The deity of Radha Raman (one of the few original Deities still left in Vrindavan) was worshipped by Srila Gopal Bhatta Goswami. The deity self-manifested from one of the Goswami’s saligram silas in 1542. Before lunch went to Nidhi Van. It has wild tulsi trees like Sewa Kunj and Swami Haridas ki samadhi. Since it was 12 noon went to Brahma Kund i.e. maintained by the Braj Foundation. Wish all the kunds were as well laid out and maintained. It is very close to the South Indian temple. After lunch went to the Govind Dev temple built by Raja Mansingh 1590. It originally had 7 storeys, four of which were destroyed by Aurangzeb. On the 7th storey was a diya (lamp) whose light could be seen from Delhi. When Aurangzeb attacked the temple its caretakers smuggled out the moorthi of Govind Devji. At 4pm went to the Katyani Devi Mandir. According to tradition Sati's hair fell at this place. After that went to the Jaipur Temple i.e. a 10 minute walks from Govind Dev. A must see for architecture, see photo gallery. The last stop was Raghunathji Mandir. It was made by a Digambari Jain businessman from Mathura sometime between 1860-1870. Apparently the 60 year old rich businessman did not have sons. During a yatra to Badrinath he met a South Indian sage who asked him to do a couple of things and blessed him. Thereafter he had two sons and made two temples one Raghunathji in Vrindavan and two Dwarkadish in Mathura. This temple is a combination of Rajput and South Indian styles. Was told that the priests are all from the South. The third day was dedicated to the Govardhana parikrama. The distance from Vrindavan to Govardhana is 20kms but the roads are bad, took about an hour. Left Vrindavan at 5.30 am by share an auto. Started the parikrama at 7am. It has two parts. part one is round the Holy Mountain and ends at Govardhan itself. Part two is from Govardhan to Radha Kund and back. It was raining for most parts during parikrama one. Important point is Mukharvind where Lord Krishna lifted the Govardhan. Offered jalebis to the Lord and did Abhishek of the mountain with 5 litres of milk. After that climbed up a hill and saw temple where Shrinathji was originally kept before being shifted to Nathdwara Rajasthan. Moorthi was shifted to prevent its destruction by Aurangzeb. There are many kunds or holy tanks enroute for e.g. Govind Kund. Radha/Shyama Kund was a long walk. Was very tired on the return so took an auto to Mansiganga. According to tradition Lord Krishna used his flute to get water at this point. Reached Vrindavan by 4pm. Was very tired so went to sleep. Do attend the 7pm at ISKCON. For want of time could not attend. The next morning attended the 4am aarti at ISKCON. It is a very spiritually fulfilling experience. By 8.30am left to see Dauji Mandir (Lord Balaram temple) i.e. about an hour’s drive from Vrindavan. From there went to Gokul where Lord Krishna spent his childhood. Last stop was Mathura where went to Krishna Janamsthan and Vishram Ghat i.e. on the banks of the river Yamuna. Have the dahi wada and pani puris at Vishram Ghat, very tasty. Returned to Vrindavan by 3.30pm, had lunch and left for Mathura to catch the 6.40pm August Kranti Rajdhani Express to Mumbai. It was amongst the most fulfilling yatras that I had in a long time.